Welcome to the debut of Booklicious Reviews! I'm very excited about this new addition to the site, and I hope it'll be a way for you to discover some new must-reads (and hopefully few must-not-reads). First up is a set, actually: The Further Adventures of Sherlock Holmes, published by Titan Books. Four volumes are currently available, with two more scheduled for a February release. My partner in real-life crime — and now virtual crime, it appears — has graciously offered to do the reviewing honors. His words after the jump. “Sir Arthur Conan Doyle’s timeless creation returns in a new series of handsomely designed, long out-of-print detective stories,” the Titan Books website proclaims, and not without cause. The four available novels, originally published between 1975–1989, are very attractive indeed, and with more books set to come out early next year they are poised to become a collection that can proudly adorn any shelf, mantle, bookcase or even toilet tank (although I doubt Sir Doyle would approve). 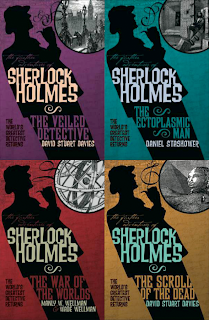 Both Sherlock Holmes diehards and readers new to the deerstalker-sporting sleuth can start the storyline afresh by reading the first in the series, The Veiled Detective by David Stuart Davies. It details the beginnings of Sherlock’s illustrious career, as well as the origins of other characters such as Moriarty and his henchmen and John Watson. Quickly filling in the gaps between the novels, it launches the “further adventures” in grand fashion. Each of the four new editions can stand alone, however, if you’d rather not buy the whole set at once (nothing wrong with a little recession-era frugality). In The Ectoplasmic Man, Holmes and Houdini match wits and join forces under the Prince of Wales, and in The Scroll of the Dead Holmes takes a working vacation in England’s world-famous Lake District to stop a fraudulent medium (and probably an unlicensed Egyptologist to boot) bent on wresting the secret of immortality from ancient Egyptian papyri. For even more fantastic melding of genres and literary eras, head straight for The War of the Worlds, in which Holmes and Watson amble about the ruined streets of London looking for an explanation as to the Martian attack on Earth (yes, that same Martian attack H. G. Wells scripted and Tom Cruise managed — surprisingly — not to completely butcher). The four books are each a delight to read, with a Victorian flavor and decidedly post-Victorian succinctness. The only word of warning for gift givers, librarians and parents of impressionable youth is that, as in the original novels, there is a bit of drug use in some of the books and allusions to it in others. Unlike most paperbacks in their price range — $9.95 apiece — the physical aspects of the books also deserve praise. The covers boast energetic designs with bold colors and insets of period-style art. The name “Sherlock Holmes” is embossed and slick to to the touch, the spines display the titles and color schemes well enough to recognize a book from across a room and uniformly enough that I’m fantasizing about filling an entire shelf with them. What’s even better is the way they feel: the covers have a smooth luxuriousness that makes them even harder to put down. The typeface is fitting of the books’ Victorian-lite nature, and the paper is a far sight from the pulp novels of the era. I don’t know if this is a selling point to most, but the books also have a nice “reading copy” smell about them.